You are here: Home / Transportation / Lyft Launches in Pittsburgh: Can a Pink Mustache Solve Our Cab Problem? UPDATE March 2014: If you are interested in trying Lyft – click here to get $25 in ride credit. If you are interested in becoming a driver for Lyft – click here to apply. I think that one of the things that keeps Pittsburgh from being competitive with other cities is transit. Both transit to and from the city and transit within the city limits. Can New Apps/Services Address the Cab Problem in Pittsburgh? If you go to most major US cities – you can hail a cab. It is no secret that, unless you are standing at a downtown hotel, it is near impossible to get a cab in this city. The lack of access to cabs causes all kinds of problems and puts more cars on the streets, more cars mean we need more parking. More parking means we need more parking garages. The lack of access to cabs also leads to more drinking and driving. There are three startup companies that have been working on the cab situation in other cities – Uber, Lyft and Sidecar. We’ve heard rumors that Uber has been looking at Pittsburgh for a while and we know they have just hired a Pittsburgh representative. (There is also a local startup CabbyGo but I haven’t learned much about them). Lyft is launching in Pittsburgh tomorrow (Friday, February 7) – and I think this is a big deal for this town. 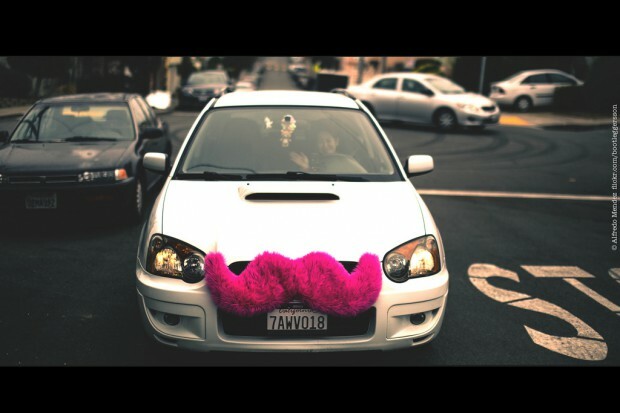 Lyft is a community ride service and the Lyft cars are identified by pink mustaches. Lyft is more than just an alternative to a cab, they seem to be building an extensive community of riders and drivers. Check out the intro to Lyft video here for more details on the service and the community aspect. So, your excited about riding in cars with strangers? Is that safe? I will be the first to admit that I was very skeptical of the idea of riding in a strangers car or driving other people in my car. But I think the Lyft service is worth a look and from everything I’ve read – I think it is pretty safe. All of the drivers have passed a background check and are interviewed by the Lyft staff. I’ve heard great thing about Lyft and I wanted to learn more. I downloaded the app and applied to be a driver. Watching the driver education videos really changed my opinion of the service. Even if you don’t want to become a driver, I would recommend that you download the app and start the application. The first step of applying is to watch three videos about the service. I’ve tried to find those videos online but apparently they are only available in the driver application. To help kick off Lyft’s service in Pittsburgh – you can become a Lyft Pioneer and your rides for the next two weeks are free. You can get the details on becoming a Lyft Pioneer in Pittsburgh on this post I wrote for the c-leveled blog. You can follow Lyft on Twitter @Lyft and use the #LyftOffPittsburgh to share your Lyft experiences.